What Does Code P0406 Mean? What are the common causes of code P0406 ? Depending on year, make, and model, DTC P0406 may have number of causes. Here are some of the most common. What are the symptoms of code P0406 ? How do you troubleshoot code P0406 ? 2005 Dodge Magnum, ESP/BAS MIL illuminated in dash, No brakes. 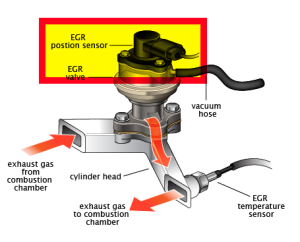 As far as I know, the EGR position sensor is integrated into the EGR valve. It’s not a serviceable part, so you’ll have to replace the whole valve assembly. The only difficulty here is that, because the EGR valve is constantly subjected to exhaust heat, the fittings may be stuck. Plenty of WD-40 and perhaps the application of heat and patience will go far to removing the EGR valve without any collateral damage. You can use a touch of anti-seize lubricant on the threads of the fitting when you install the new EGR valve. Code read P0406 & I bought a EGR valve & put it in. reset computer but engine light still on. went to have code read again gave same code + P0108? What should I do to repair this?? ?